The purpose of the research is to determine if soil solarization under Pacific Northwest conditions is a feasible strategy for managing weeds and soilborne pathogens in tree seedling nurseries. We conducted replicated on-farm trials to test the efficacy of soil solarization in commercial tree seedling nurseries in Mima, WA; Boring, OR; and Yamhill, OR. We also conducted a replicated field experiment to examine how soil moisture and solarization duration affect solarization effectiveness. We examined soil solarization effects on viability and germination of four weed species, quantified fall emergence of naturally occurring weeds, measured impacts on populations of soilborne Fusarium and Pythium spp., examined effects on soil microbial communities, and monitored soil temperature, soil moisture, and local weather during the experiments. We demonstrated that soil solarization resulted in crop growth benefits and reduced the time needed for hand weeding by 52-54%. We produced an initial version of an online soil solarization model to help growers forecast the effectiveness and minimum time required to achieve effective soil solarization based on their location and start date. Other outreach activities included four talks to Pacific Northwest grower groups, a field day, a grower workshop, publications in two grower magazines, and thirteen presentations at regional or national scientific conferences. Determine if soil solarization is an effective and economically feasible way to control weeds, soilborne plant pathogens and improve tree seedling growth in Pacific Northwest nurseries. Optimize soil solarization for Pacific Northwest conditions. Determine optimal solarization duration by evaluating the effect of soil moisture conditions and soil texture on achieved soil temperature. Develop a web-based grower-friendly model for predicting the length of time necessary for disinfesting bareroot nursery soil based on geographic location, soil moisture content, and start date. This project tests the hypothesis that pre-plant soil solarization will be a feasible and effective way to manage weeds and soilborne pathogens in Pacific Northwest tree seedling nurseries. Fig. 1. Photos taken at one field site (Boring, OR) over a 2-year period to show soil solarization (Fig. 1.a), and the same beds the next year to show differences in weed growth in May (Fig. 1.b.) and crop growth differences in July (Fig. 1.c). The crop is Mazzard cherry. Objective 1: We conducted efficacy trials in three commercial tree seedling nurseries in Mima, WA, and Boring and Yamhill, OR, in 2016 and 2017. In each location, there were two treatments (solarized for 6 weeks or non-solarized) and three replicates per treatment. At Mima, WA we also included a treatment of methyl bromide fumigation in 2016. Individual plots were 30.5 m by 1.2 m. Weed seed packets containing seeds of Poa annua, Polygonum pensylvanicum, Amaranthus retroflexus, and Portulaca oleracea were buried in each plot at 5 and 10 cm depths. Composite soil samples containing indigenous soilborne pathogens and other microbes were placed in sachets and buried at 5 and 15 cm depths. After the trial, weed seed germination and viability were tested in the lab. Weed emergence was counted in 0.25 m2 plots the following fall and spring. We also determined the time required for field laborers to hand weed solarized and solarized plots at the two Oregon locations in 2018. Plate counts of Fusarium spp. and Pythium spp. were determined from the composite soil after the trial, and DNA was extracted for subsequent analysis of fungal, oomycete and bacterial communities with Illumina MiSeq. Soil temperature and moisture were monitored continuously with reflectometers attached to a datalogger. Weather stations at each site measured air temperature, wind speed, and solar radiation. Crop growth was monitored in the year after solarization (2017 and 2018). Crop parameters included stand density, seedling height and stem caliper. Soil samples were collected from the top 15 cm of soil in all plots before and after solarization and brought to the Central Analytical Laboratory at Oregon State University for nutrient analysis. Soil pH was measured using a pH probe, total carbon and nitrogen were assessed using a dry combustion method (Elementar), and nitrate and ammonium were extracted from soil with a 2 M potassium chloride extractant and measured with a Lachat flow injection analysis system. Objective 2: In 2016 at the Boring site, we conducted a factorial experiment designed to determine optimal soil moisture conditions and minimum duration for effective soil solarization (Fig. 1). Four soil moisture levels (low = 13%, medium = 17%, high = 23%, and very high = 25% volumetric water content) roughly corresponding to initial values of 56, 73, 100 and 108% field capacity at the 5 cm depth were achieved with drip irrigation under the plastic, and compared over 3 different durations of solarization (3, 6, and 9 weeks) or a nonsolarized control. Pathogen populations, weed seed viability, weed emergence and crop growth were quantified as described in Objective 1. Pythium spp. and Fusarium spp. were quantified from the composite soil samples buried at 15 cm through dilution plating. DNA was extracted from soil buried at 5 cm for subsequent analysis of soil oomycete, fungal, and bacterial communities. To determine if soil solarization has a lasting impact on soil microbial communities, we collected soil in April 2017, seven months after the solarization trial, soon after tree seedlings in these plots emerged. 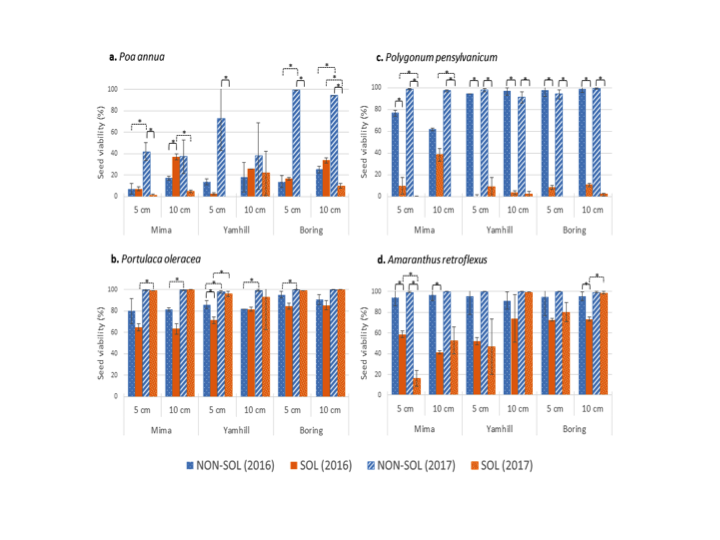 We repeated the soil moisture by solarization duration factorial experiment in 2017 but unlike 2016, treatments were completely randomized to reduce error associated with non-uniform distribution of soilborne pathogens and weeds. Similar soil moisture levels were achieved as for the previous year: low = 15.4%, medium = 18.9%. high = 20.4%, and very high = 25.5% volumetric water content (5 cm depth). 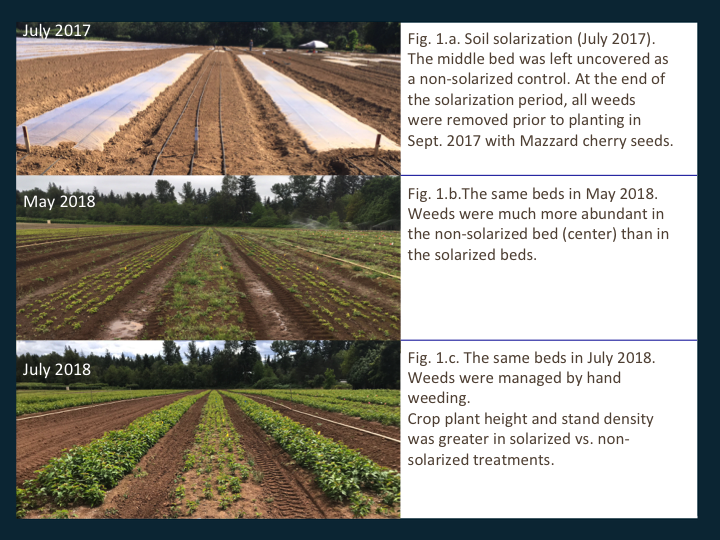 As a further step to optimize solarization for the Pacific Northwest, we conducted a biosolarization experiment designed to test the effectiveness of solarizing soil after incorporation of a cover crop. The biosolarization experiment included 2 solarization treatments (solarized and non-solarized) x 2 cover crop treatments (with and without a cover crop) x 2 soil moisture levels (high and very high) in a split-plot design with 2 durations (2- and 4-weeks). Plots were 7.62 m x 1.2 m and there were four replications per treatment. Weed seed packets and soil sachets were buried 10 cm below the soil surface. Soil moisture and temperature were monitored as described above. Crop growth was measured in 2018. Objective 3: Development of a mathematical model that is applicable across soil textures and solar irradiation conditions (climate and latitude) necessitates that we first quantify the heat transfer coefficient across the air-plastic-soil interface. Detailed monitoring of heat transfer will be performed using a subset of plots at the research site. Data will be used to validate and if necessary fine-tune the “to-be-modified” HYDRUS model to simulate the heat transfer in the soil under plastic mulch (Fig. 2). Figure 2. 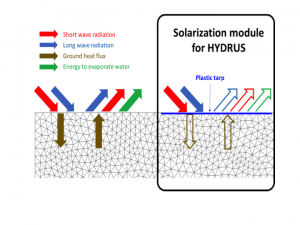 Schematic of the impact by plastic tarp in changing the net reflection and transfer of solar heat to soil. HYDRUS module will account for the effect of the plastic in the soil-atmosphere boundary condition. In 2017, two 10 m by 6 m plots with three insets of 80 cm by 30 cm deep holes (instrumented locations) were prepared (Fig. 3). One plot was covered with a solarizing plastic sheet and the other plot was left as bare soil. Each inset was packed with soil sieved through 2 mm. 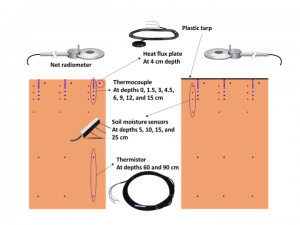 This level of homogeneity is required to guarantee good soil contact with instruments installed for monitoring soil temperature, soil heat flux, and soil moisture. Figure 3. Vertical cross-section schematic of instrument installation at the research site that was used to obtain data for the HYDRUS module development. The difference between the left and right hand plots is the existence of the plastic at the soil-atmosphere boundary. A total of 48 thermocouples monitored soil temperature at depths 0, 1.5, 3, 4.5, 6, 9, 12, 15 cm for three replicates in each of the two plots. Decagon GS3 sensors were used to monitor soil moisture and temperature at depths 5, 10, 15, and 25 cm for three replicates in each of the two plots (24 total). Two thermistors were installed at 60 and 90 cm depths in each plot to monitor the deep soil profile temperature. Heat plates were installed at the 4 cm depth for all three replicates in each plot to measure soil heat flux and soil thermal diffusivity. A net radiometer was installed in each plot to monitor the net radiation above both the bare soil and the plastic sheet. Ambient air temperature was measured in the bare soil plot. Both plots were monitored for few days prior to solarization and the data will be used to compare the soil data and net radiation between the two plots. The solarization plot was then covered with plastic for a period of two weeks to compare the soil temperature and heat flux between solarized and non-solarized plots under dry soil conditions. It is known that soil thermal properties are changed by moisture. Therefore, the plastic cover was removed after 2 weeks and the soil moisture of both plots brought to field capacity using a sprinkler irrigation system. Upon completion of irrigation, the solarization plot was recovered with plastic to compare the soil temperature and heat flux between the solarized and non-solarized plot under wet soil conditions. We developed an initial version of the online soil solarization model from data for two soilborne pathogens, Phytophthora ramorum and Phytophthora pini. Interactive sessions were conducted with selected growers to identify common problems with the online tool, leading to improvements to the user interface and model output. Controlled environment experiments were conducted with four weed species (annual bluegrass, common purslane, Pennsylvania smartweed, and redroot pigweed) and two plant pathogen species (Fusarium oxysporum and Pythium ultimum) to determine the relationship between exposure to high temperatures and mortality. The six additional species will be added to the online model in early 2019. Objective 1: A summary of 2016 and 2017 soil temperature data is shown in Fig. 4. For all sites and both years, solarization successfully increased the maximum soil temperature at 5 and 15 cm depths, as well as the thermal hours over 35°C. The increase at Mima was less than at the other two sites. Cloud cover strongly suppresses soil temperature; 2016 had more cloud cover and was colder than the average, whereas, 2017 was warmer than the average. Comparing both years provides an idea for the range of effectiveness of this method on soil temperatures, clearly demonstrating that even during cold years, solarization significantly increases soil temperatures. Figure 4. Summary of soil temperatures comparing solarized and non-solarized plots, for the 2016 and 2017 field season. Stippled blue is non-solarized. Yellow shows enhanced effect of solarization. For both years, at all sites and depths, solarization was most effective on Polygonum pensylvanicum, least effective on Portulaca oleracea, and resulted in increased dormancy in Amaranthus retroflexus. In 2016, more Poa annua seeds survived at 10 cm in solarized plots than in non-solarized plots, while in 2017, solarization successfully reduced seed viability at all depths (Fig. 5). Figure 5. Seed viability of 4 weed species after burial at 5 or 10 cm in solarized or non-solarized plots at 3 locations in 2016 and 2017. The density of emerging fall and spring weeds was reduced in solarized beds as compared to nonsolarized beds. For example, at Boring in 2016, fall weed seedling density was 0.21/0.25 m2 in solarized beds as compared to 5.26/0.25 m2 in non-solarized beds. 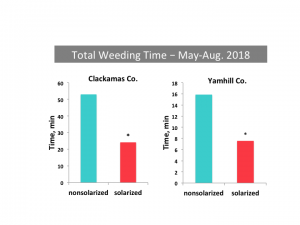 The season-long time required for labor crews to hand weed plots was reduced by 52-54% in solarized beds compared to nonsolarized beds at Boring (Clackamas Co.) and Yamhill (Yamhill Co.), respectively. Fig. 6. Time required to hand weed solarized and nonsolarized plots. For both years, at all sites, Fusarium spp. and Pythium spp. were not recovered from solarized plots from the 5 cm (=2″) depth. Both pathogens were recovered from the 15 cm (=6″) depths but populations were generally reduced by solarization. Results for 2017 are shown in Fig. 7. Fig. 7. 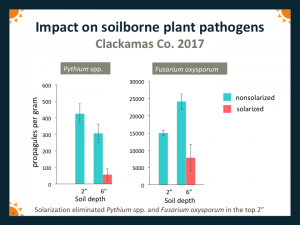 Impact of soil solarization on the soilborne plant pathogens, Pythium and Fusarium oxysporum at the Boring (Clackamas Co.) location in 2017. Soil solarization had significant effects on the soil microbial community, especially at the 5 cm depth. Diversity of bacteria, fungi and oomycetes was reduced by solarization, although populations of certain microbes increased following solarization. Changes to the relative abundance of bacteria at one site is shown in Fig. 8. Fig. 8. 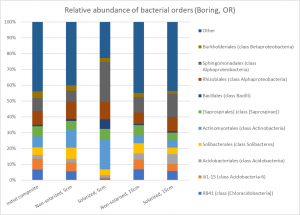 Relative abundance of dominant orders of soil bacteria at Boring, OR site in 2016 and 2017. Crop growth in the year following solarization was generally significantly greater than in nonsolarized plots. For example, at the Boring site in 2018, average height of Mazzard cherry seedlings grown in solarized plots was 76% greater than for seedlings in non-solarized plots (Fig. 8). 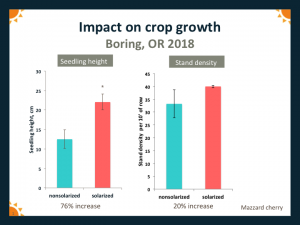 At Yamhill in 2018, average height of apple seedlings in solarized plots was 54% greater, and stand density was 24% greater, than for seedlings grown in nonsolarized plots (Fig. 9). Fig. 8. Impact of soil solarization on subsequent crop growth – Boring, OR 2018. Fig. 9. 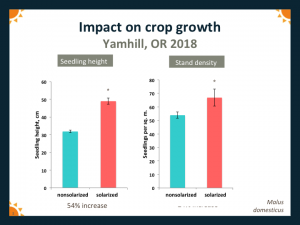 Impact of soil solarization on subsequent crop growth – Yamhill 2018. Objective 2: The moisture by duration experiments showed strong difference between the 2016 and 2017 year with respect to the effect of moisture content on the total hours achieved over 35°C. In 2016, the highest impact was seen for medium moisture contents, but this is not as clearly seen in the 2017 data (Fig. 10). There was a strong effect of soil moisture on the duration of solarization required to suppress weeds. In 2016, a 3-week solarization period was just as effective as 6- or 9-weeks of solarization as long as the soil moisture level was high or very high (Fig. 11). 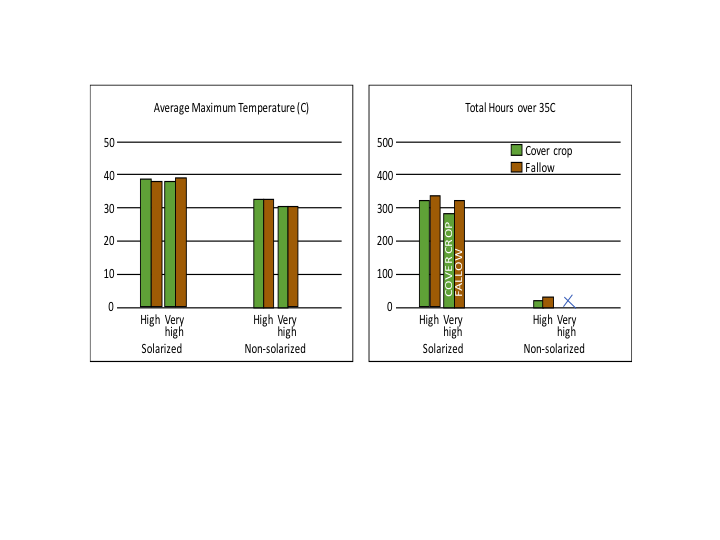 This suggests that solarization effectiveness is not simply a function of soil thermal hours, which was highest in the medium soil moisture treatment. These results also indicate the potential feasibility of solarizing soil in Pacific Northwest cropping systems when the summer fallow period between crops is short. Figure 11. Weed emergence (all species) following solarization periods of 3, 6, or 9 weeks at low, medium, high, or very high initial soil moisture levels (Boring, OR). The 0 week treatment is a non-solarized control. Values are means ± SE. Different letters above the bars indicate statistically significant differences (P ≤0.05). Soil moisture did not have a strong effect on Pythium spp. or Fusarium spp. but all solarized soil had significantly lower populations of each group of organism than initial composites, even after 3 weeks of solarization. The Illumina Mi-Seq analysis of the bacterial communities indicate differences between communities in the three solarized treatments vs. the non-solarized treatment, and between low moisture vs. all other moisture levels. Treatment differences in bacterial communities were evident seven months after the solarization trial ended. Initial results from the biosolarization experiment showed that the plastic cover increases the maximum temperature and hours above 35°C similarly for both fallow and cover crop conditions (Fig. 12). The impact on weeds and pathogens is still being analyzed. Figure 12. 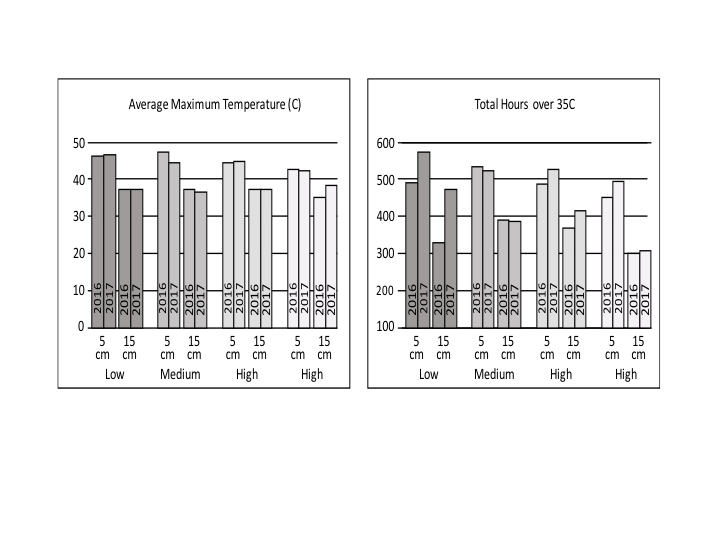 Soil temperature for treatments with and without cover crop, and for two different moisture contents. The “x” on the graph for non-solarized-very-high moisture is to emphasize that the value is indeed zero. We released an initial version of the online soil solarization model at http://uspest.org/soil/solarize. Growers can select the weather station nearest to their farm and choose intended start and end dates for solarizing. The model output includes the predicted temperatures at 3 soil depths, and forecasts the length of time required to solarize to kill soilborne Phytophthora species (P. ramorum and P. pini). The model was quite good at predicting actual soil temperatures in the 3 field trials conducted in 2016 but less accurate when predicting the 2017 data set. An intensive field-laboratory was instrumented to obtain detailed thermal data. 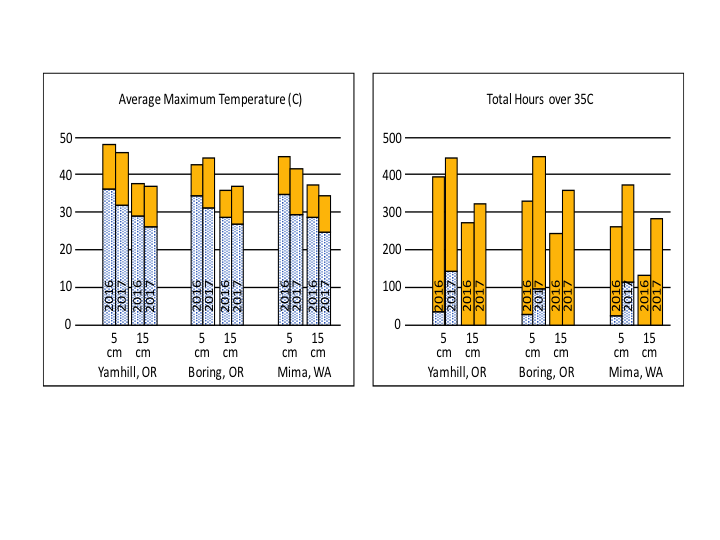 The data shows a phenomenon of deep soil heat storage associated with periodic storm patterns that results in two distinct air-soil temperature calibration curves (Fig. 13). Soil thermal dynamics are being analyzed to determine if this hysteretic calibration curve (which depends on antecedent soil heating) will improve the predictive model capabilities since accounting for the amplitude of the hysteretic loop could improve prediction error by at least 5 C.
The second advance toward model improvement is the identification of a parameter set to determine the earliest possible date for solarization. The two parameters are the seasonal soil temperature at 10 cm and the solar irradiation. Soil temperature changes diurnally and seasonally. Regardless of the level of solar irradiation, it was found that the seasonal soil temperature at 10 cm depth had to reach a minimum of 22 C before solarization could be used. This value determines the earliest spring date and latest fall date for applying solarization. This constraint only requires regional knowledge of soil temperature at 10 cm depth which is commonly available from the network of weather stations. The parameter associated with minimum solar irradiation is still being developed. Interactive sessions were conducted with selected growers to identify common problems with the online tool, leading to improvements to the user interface and model output. Future work will improve the model of soil heating for more accurate forecasting, include grower workshops to train users in how to use the online tool and include additional targets of soil solarization such as weed species and other soilborne pathogens. The data to be used for the HYDRUS module development is still being analyzed, and the module will be developed during this next project year. Figure 13. While a trend through the entire data set would predict the light blue line, time-dependent analysis of the data shows hysteretic loops in the data that indicate the existence of two soil-thermal states with two calibration curves indicated by the black lines. Small blue dots are data, large colored dotes highlight groups of consecutive days over a 32 days period. The dashed arrows represent the general circulation of the hysteretic temperature curve. Education and outreach consist of several different activities. On-farm research and demonstrations were conducted at three participating nurseries. Each year, a field day will be held at one nursery where growers can observe differences in weed populations and plant growth. Equipment for bed formation and mulch-laying equipment will be demonstrated and soil temperature and weed count data will be shared via printed handouts. YouTube videos that show results and teach concepts will be created and posted. Presentations to growers will be made at regional meetings such as Oktoberpest and the Shadetree Grower Group. Articles will be published in nursery and forestry trade journals and in peer-reviewed journals. At least one paper will provide an economic analysis of soil solarization in comparison to current methods of control. The final outreach component will be development of a web-based predictive model to enable growers to determine the feasibility and length of time necessary to disinfest soil with solarization. The model will potentially be added to an existing W-IPM Centers-supported IPM decision support system, at http://uspest.org/wea. The predicted outcomes of the project will include knowledge on the feasibility of utilizing soil solarization for weed and pathogen control and practical advice and a web-based tool for optimizing soil solarization in the Pacific Northwest. On-farm field day. Soil solarization as an integrated pest management tool in tree seedling nurseries in the Pacific Northwest. June 28, 2017. Boring, OR. 40 attendees. Talk and demonstration. Soil solarization for native plant nursery growers. Sept. 9, 2018. San Rafael, CA. 45 participants. Half-day grower workshop and demonstration on soil solarization at the N. Willamette Research and Extension Center, Aurora, OR. October 29, 2018. 42 participants. Doane, S. 2016. What’s Going Down? How to reduce off-target losses and lower pesticide risk using decision support tools. Oktoberpest: Pest Management Workshops for Greenhouse and Nursery Growers. Going Soft: Designing Target-Focused IPM Programs. Oct. 6, 2016. N. Willamette Research and Extension Center, Aurora, OR. Oral presentation. 25 attendees. Doane, S. 2017. Soil solarization trials at J. Frank Schmidt and Son, Co. Nursery. Clackamas River Basin Council. Mar. 16, 2017. Oral presentation. 30 attendees. Elliott, M.E., and Parke, J. L. Preventing Phytophthora contamination in native plant nurseries. May 9, 2017. Research and Extension Center, Washington State University-Puyallup, Puyallup, WA. 19 participants. Parke, J. 2016. Soil solarization for management of pathogens and weeds. Integrated Pest Management for Nursery, Reforestation, and Restoration Programs. Joint annual meeting of the Western Forestry and Conservation Nursery Association and the Intermountain Container Seedling Growers’ Association, Sept. 14-15, 2016. Troutdale, OR. Oral presentation.110 attendees. Parke, J. L. 2017. The state of Phytophthora management: a view from the nursery. Phytophthora Species in Restoration Nurseries, Plantings, and Wildlands II. San Jose, CA. May 18, 2017. Invited presentation. 145 participants. Parke, J. L. 2018. Plot size influences effectiveness of solarization to control soil Phytophthoras. Invited talk. Phytophthoras in Native Habitats Work Group. Albany, CA. June 21, 2018. 45 participants. Parke, J. L. and Elliott, M.E. 2017. Preventing Phytophthora contamination in native plant nurseries. Apr. 26, 2017. N. Willamette Research and Extension Center, Aurora, OR. 13 participants. Funahashi, F. and Parke, J. L. 2016. 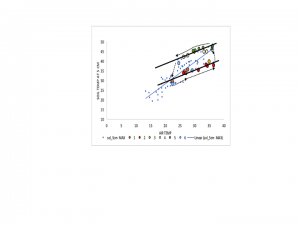 Development of a predictive model to estimate the effect of soil solarization on survival of soilborne inoculum of Phytophthora ramorum and Phytophthora pini. Sixth Sudden Oak Death Science Symposium, June 20-23, San Francisco, CA. Poster presentation. 85 attendees. Mallory-Smith, C., Wada, N., Parke, J. 2018. Weed control in Pacific Northwest tree nurseries using soil solarization. Oral presentation. 18th European Weed Science Society Symposium. June 17-21, Lubljana, Slovenia. Parke, J., Coop, L., Dragila, M., Funahashi, F., Hill, B., Kandelous, M., Mallory-Smith, C., Nackley, L., Wada, N., and Weidman, C. 2018. Soil solarization for integrated pest management in the Pacific Northwest (USA). Poster presentation. 9th International IPM Symposium. Mar. 19-22, Baltimore, MD. Parke, J. L., Funahashi, F., Weidman, C., and Peterson, E. K. 2016. Relative heat sensitivities of certain Phytophthora spp. and the potential for soil solarization to disinfest nursery beds in west coast states. Sixth Sudden Oak Death Science Symposium, June 20-23, San Francisco, CA. Oral presentation. 85 attendees. Parke, J., Mallory-Smith, C., Dragila, M., Hill, B., Wada, N., Weidman, C., Nackley, L., Coop, L., and Funahashi, F. 2018. Soil solarization for managing weeds and soilborne plant pathogens in tree seedling nurseries in the Pacific Northwest. Poster presentation. SARE Our Farms, Our Future Conference. April 3-5, St. Louis, MO. Redekar, N., Trammell, C., and Parke, J. L. 2018. Solarization effects on the soil microbiome at an organic vegetable farm in the Pacific Northwest (USA). Poster presentation. Intl. Congress of Plant Pathology, July 29-Aug. 3, 2018, Boston, MA. Wada, N., Parke, J., and Mallory-Smith, C. 2017. Soil solarization for weed control in Pacific Northwest field nurseries. Western Society of Weed Science Annual Meeting, March 13-16, 2017. Coeur d’Alene, ID. Oral presentation. 25 attendees. Wada, N., Parke, J., Berry P.A., Bobadilla, L.K. and Mallory-Smith, C. 2018. Comparison of Solarization and Biosolarization for Weed Control in a Tree Seedling Nursery in Western Oregon. Western Society of Weed Science Annual Meeting, March 12-15, 2018. Garden Grove, CA. Poster presentation. Wada, N., Parke, J., Berry P.A., Bobadilla, L.K. and Mallory-Smith, C. 2018. 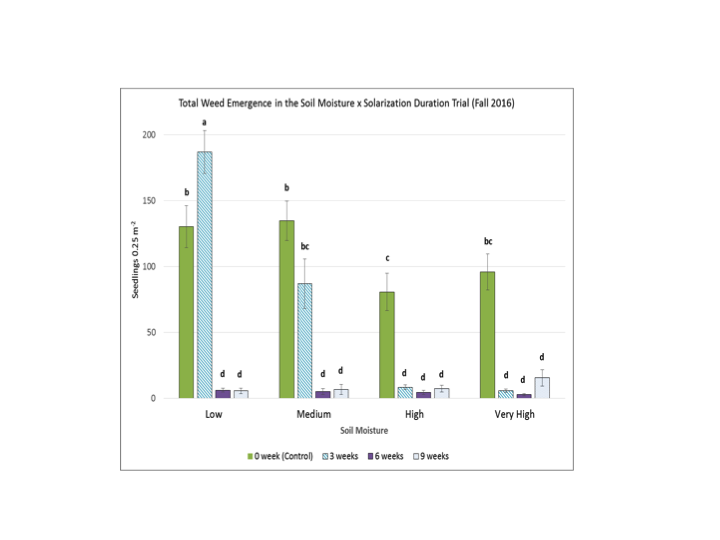 Soil Solarization in Oregon: The Impact of Solarization Duration and Soil Moisture on Weed Control in a Tree Seedling Nursery. Western Society of Weed Science Annual Meeting, March 12-15, 2018. Garden Grove, CA. Oral presentation. Weidman, C. S., Moore, A. D., and Parke, J. L. 2018. Soil nutrient responses to soil solarization. Poster presentation. Oregon Society of Soil Scientists, Winter meeting, Feb. 28-Mar. 2, Corvallis, OR. Funahashi, F. and Parke, J. L. 2018. Thermal inactivation of two Phytophthora species by intermittent versus constant heat. Phytopathology 108:829-836. If soil solarization proves to be effective, nursery growers will be able to produce crops with fewer pesticides, particularly herbicides, and save labor costs needed for hand weeding. Results from each of two commercial nurseries indicate that the season-long time needed to hand weed solarized beds was reduced by 52%-54% compared to time needed to hand weed non-solarized beds. In the case of forest tree seedling nurseries, soil solarization could reduce the need for fumigation with methyl bromide, an ozone-depleting fumigant.